Bill Leithhead's Personal Blog – Page 2 – Occasional remarks upon life's pleasures and pains. We’ve had a marvellous whole day (two nights) at Lightning Ridge and loved it, but must move on, to where we don’t quite know. We did an excellent Black Opal tour with a dozen people in a small bus. The big steps were a struggle for us both! Over the duration about 4 hours, an English (Lancaster) driver both entertained and informed us, as we toured a lot of the “camps” and other notable things in this strange place. I’m very tired and can barely type. This fatigue is becoming a major problem for us both. We’ve got over 200 photos but I haven’t time to process images and write about things we have experienced. 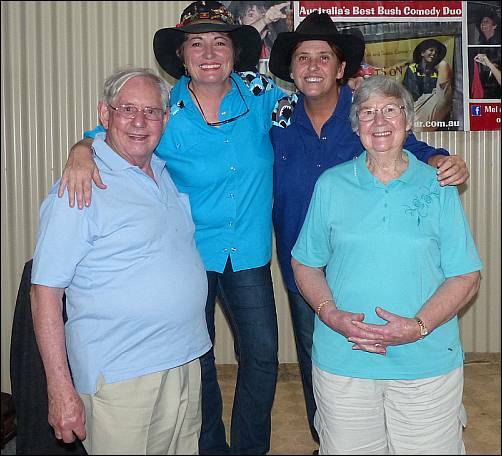 Us with Melanie Hall and Susan Carcary in Lightning Ridge. I apologise that there has been a hiatus in this trip blog for several days. I am posting almost daily updates through my Facebook page at Bill Leithhead (I’m the one at Glen Waverley), because it’s easier to take phone photos with my Samsung Galaxy 3, then post them straight into FB. I am also attempting to do this blog, which needs images put through the laptop (I haven’t tried that via the phone). And that needs the images to be down-loaded from camera into appropriate laptop folders, then the images cropped, the quality adjusted and then images resized down to about 300 pixels wide for this blog. That needs my use of either Paint Shop Pro 8 or Irfanview on this laptop, then insertion of the image and editing into the blog text. So that takes a lot of extra effort! I’ve also been SMSing the family, with one or two hiccups, and emailing them and others. this all takes time. See, what has happened was that by Friday night, we found ourselves completely exhausted from our first three days of travel. We were extremely surprised by this, and dismayed. We’ve done big trips before, but the years have passed and arthritis has taken its toll, among other things. I think it’s not so much the driving, but all of the extra bending and twisting that are part and parcel of caravan living. This is exercising muscles unused to it, and that’s good, and that will improve our fitness and weight in a month or so. So on Friday night we arrived at Gilgandra, and barely had enough energy to do more than set up the van, prepare meals, eat, wash up, take medications, and do the usual chores around the cramped van necessary for good order., and then we wrote our written trip diaries, which we have had the habit of doing for over 15 years. Then I did the charging of cameras, phone, etc., and we both had insufficient energy to do more than the minimum, so we flaked out early and slept well through without waking. Saturday we pushed off for Moree, via Coonabrabran, a favourite town, where we had lunch and revisited the Crystal Kingdom, initially visited on a Cairns trip in this very van with our three young children in 1979. 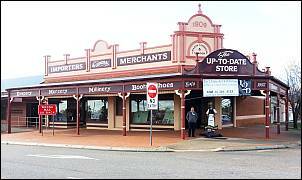 Then off to Moree, where we now are. Settled in Moree for 3 days, recovering and relaxing in the artesian baths..
We booked in for 2 nights at the Gwydir Carapark, here in Moree, and have now had a relaxing day today – Sunday 17th, and have booked in for Monday night as well, giving us a free day to relax tomorrow. The hot artesian pools are excellent! 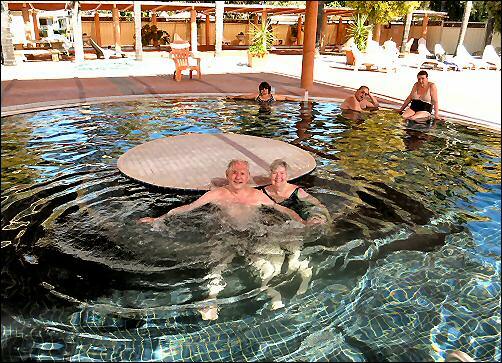 Myself and Glenyce relaxing in the hot artesian baths at Gwydir Carapark, with baths at 28 (lap pool), 34, 35, 37 and 39 degC. The latter is very tiring and limit said to be 15 mins. Some of this water comes from the coastal mountain ranges, and it takes up to 2 million years to get here! —————————————–Then on Tuesday we have resolved to travel to Lightning Ridge, a westward detour of 300 km to see the black opal fields, and probably stay two nights there. Well, too much has happened so far, and we’re tired but happy. Glenyce fell off the bed wrapped in her sleeping bag at 6 am, onto the narrow space between our beds, like an upturned turtle. We sorted it out and went back to sleep, but in 50 years it has never happened before. Exciting isn’t it. We nearly ran out of petrol twice, went through towns we’ve never heard of before, and forded two slightly flooded creeks. Got to here, West Wyalong, on the Newell Highway in the dark, and had to set up by torch-light – once more, something we always avoid. 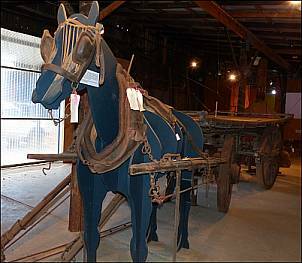 ntique tray cart from local farm, plus very original fake horse made of vertical cross-sections of dark coloured, curved wood. In Coolamon Museum, NSW,14/7/16. In the beautiful little township of Coolamon we met a nice man named Brian Holden, who showed us his museum. This was verging on staggering in its collection of old grocery store fittings and so on, and a huge display of antique farm equipment, tools, horse and carts and other vehicles and then an even more impressive collection of memorabilia from the 2nd world war (mostly the 2nd), especially regarding local personnel. “Up To Date Store” was the title given to this large store in the 1920s. It is now a museum full of the most amazing objects including much farm machinery from nearby farms, and also much memorabilia from the World Wars One and Two. Well worth while!! Trouble was, he went on for so long that we lost track of time and were late getting going again. But – unexpected surprises like this are just what are looking for on this trip. It’s a good start!! 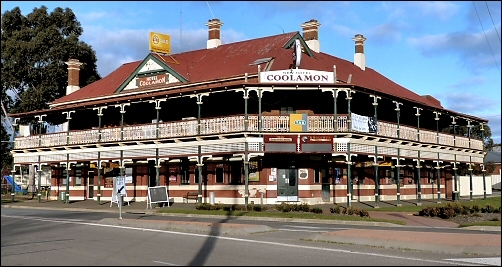 The beautifully kept ‘New Hotel Coolamon’ stands guard at the southerly entrance to the town of Coolamon. There is also an excellent museum up the street from here, as well as a range of places for good quality food. Posted on July 13, 2016 July 25, 2017 Categories Medical, TravelLeave a comment on The first leg completed relatively smoothly. Our packing is a bit of a farce, but we’ll get there. Well, it’s 10:30 pm on Tuesday night. We leave tomorrow before lunch time. Glenyce is standing staring at our double bed covered with clothing and she can’t decide what to pack, because we have to cope with the cold and the heat – well – warmth, at least. I keep telling her “We’ll just buy anything you need in Cairns!”, but the uncertainty continues. I’ve got all my stuff in the caravan, or selected already and sitting in any of 3 drawers in the family room. Being a male makes it easier, for some reason I dare not even broach. Don’t go there, guys!! About 10 shirts, 4 or 5 sets of trousers, one set of shorts, 8 pairs of socks and 8 underpants. Plus 3 jumpers – one good, one OK, and one a bit tattered and good for driving, and setting up the van on arrival at wherever we are. And one pair of bathers, togs, swimmers or cozzies (whatever), which Glenyce informs me the elastic has perished. “I’ll buy them up there”, I said. But I also need them for the four beaut pools at the caravan park in Moree, which pipes in heated Artesian water to the pools and mixes colder water in to give several pools at temperatures up to 39 degrees Celsius. The latter is very tiring, I remember from about 6 years ago when we went through. It’s quite fun there. Glenyce tells me the bathers will last through Moree. Of course, I could pack either of the ridiculous budgie smugglers I have from some years back when I passed through some phase or other – if I want to trigger a divorce! But my gut would now make me look like a muffin. It’s bad enough with the perished bathers I already possess. 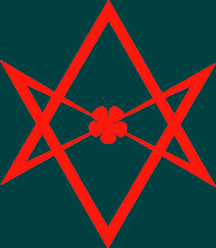 And – Oh God! – the medications – making sure we’ve both have enough of the requisite pills we take for various “medical conditions”. We’ve both got written statements about our disorders, and the prescribed medications, plus enough repeat prescriptions to last up to 10 weeks on the road. I hope to wean myself off the Temazepam I need to sleep well. I only take two at most, usually only one. But these benzodiazepines are somewhat addictive, and it’s better to not be addicted. 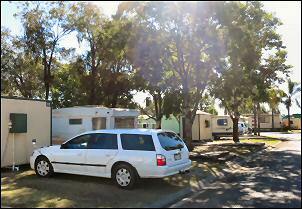 We both find that caravanning makes us healthier. We’ll return fitter, with fewer pains, and less weight!!! But as soon as I walk into the house, the post-nasal drip will return. I have no idea what causes it, but I’m allergic to something in the house. I’m not selling the house just yet. Now it’s 11 pm the night before we leave for the big trip. I have all of my data (over 800 GB) on the main desktop here at home transferred onto two 2 Terabyte hard drives, but not all, so right now I need to arrange the final backup of all of the Outlook emails (back to 2007!) and Contacts, plus all of the Internet Explorer ‘Favorites’ and ‘Cookies’, so that I can load them en route into the laptop and be ready for the road. Wish us luck as we wave goodbye soon to downtown Glen Waverley, chock-a-block with Asian restaurants and Asian groceries. A most fascinating place now, too – it was rather boring before they started coming in! Zài Jiàn, I recall it is in Mandarin. Or if you like: 再见. “Goodbye”, I think it means. Someone will correct me! Posted on July 13, 2016 July 25, 2017 Categories Existential struggles, Humour, TravelLeave a comment on Our packing is a bit of a farce, but we’ll get there. Hi everyone! Coming up to Tuesday now, the day before we leave for the first leg of our Cairns trip on Wednesday. They forecast the possibility of snow in the suburbs, so that would be novel for us. On Wednesday’s leg we only drive from Glen Waverley north-east to Wangaratta, via the Hume Highway. it’s a leisurely drive of about 4 hours, including a lunch stop at a roadhouse. 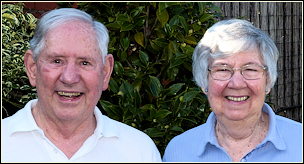 The purpose is to visit Ron and Mary Hammersley, Glenyce’s brother and sister-in-law in Wangaratta. They’ve been rather ill lately, and in their 80s, so we’ll have a good family natter and go out for dinner. Then on Thursday we’ll get an early start – about 9 am departure – that’s early for us. We’re driving from Wangaratta to Forbes – about 440 km, and that’s about my limit. After that I get severe back pain and also get dangerously sleepy, helped by No-Doz tablets (caffeine). They do help to get extra mileage, but they’re not really very strong so I take about 4 at once! I don’t do that all that often. I have driven 900 km per day on several occasions, and I don’t recommend it! Glenyce does drive with the caravan, but only small amounts of the time. Our overnight stays (at least one night) will be in sequence Wangaratta, Forbes, Coonabarabran, Moree, then perhaps St George, and then we’ll vary it, but will include Emerald (Qld), Charter’s Towers, and after 14 days travel we’ll enter Cairns on July 31st to settle in for 15 days in the beach-side caravan park at Palm Cove, north of Cairns , either coming down on that day from inland in the Atherton Tablelands, or via the coastal road. So it’ll be about 14 days of enjoyable travel in the Australian inland, starting from the Newell Highway, then varying it, especially to traverse through the Carnarvon Gorge country. We want to get well north into Queensland as soon as we can, in a business-like but leisurely fashion! Keep reading …. We’re still packing our van for the trip to Cairns! Ourselves standing next to our 50-year old Viscount Ambassador caravan, 2010 Ford station sedan and awning, flooring and bits and pieces. It suits us fine! Here we are on Monday 11th July, and we’re still leisurely doing odd jobs before the final rush of packing the van. we’ve done many long trips in it, so we’ve got our packing routine down pretty pat. The fridge is on, most of our clothing is in, and all sorts of books, medications, computer equipment and camera doodads are inside the house, because we pack them just before leaving. 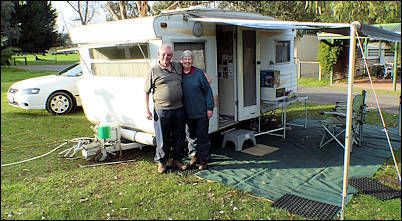 Posted on July 10, 2016 July 26, 2017 Categories UncategorisedLeave a comment on We’re still packing our van for the trip to Cairns! It’s weeks since my last post and I started this new blog to try and start over again, only to find I’m the same as I was before – for years. That should tell me something, shouldn’t it? Nevertheless, I’ll keep trying. I do procrastinate badly, and I suspect that it has prevented me from achieving about 2/3rds of what I might have done had I lived up to the unrealistic image I have of myself. 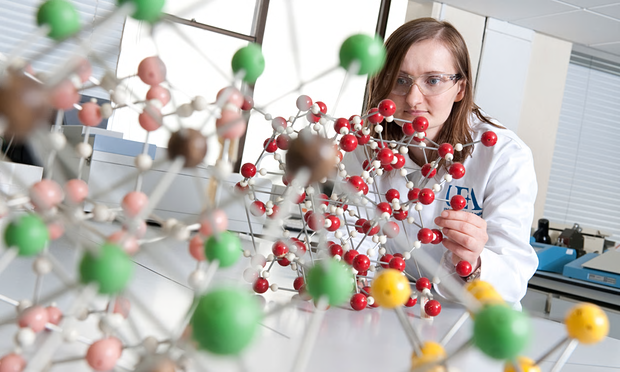 But I have achieved quite a lot in my seventy-seven years, and have gathered the sweet fruits of labours in terms of a reasonably successful career in lecturing chemistry, being married for 50 years and have 3 beautiful grown, mature children, and growing 4 grandchildren. I own my own house, am reasonably healthy if you disregard highly challenging sciatica, and a bubbling, but controlled depression. I have a couple of good computers, my own web site elfram.com, in which I’ve stuffed a ton of material, some of it interesting or even unique. And I enjoy reading, which I can do quickly. Here’s the thing: there is a huge amount of interesting, useful, valuable, educating and amusing stuff to be followed up in the net, that when I go on after my ( usually late) breakfasts, it’s usually lunchtime before I even finish reading the news and politics. Sometimes I even finish reading Facebook. And regardless of what you say, Facebook is a valuable, interesting net-space, where I have about 134 “friends”. And if I skip over the twee and the rubbish, pick up the informative, amusing and entertaining stuff, follow something up and add in some nice comments, or even add in some interesting posts myself, then I feel it’s been worthwhile. But just as an example, just in the last hour (while continually shifting the sprinklers around the garden every 10 minutes), I’ve read one topic in the highly recommended Australian political and academic TV show and web-site The Drum. I didn’t even finish, because I’m guilty as to how much time it takes out of my day. Here’s a link to the political discussion of journalist Nikki Savva’s latest book on the relationship between previous PM Tony Abbott and his fearful Chief of Staff Peta Credlin. This, including especially the Comments section, is an example of how easily a great deal of time can be eaten up, but engaging if you’re interested in Australian politics, as I certainly am. Seen in so many school reports.